Whether you're hammering out contracts or cajoling your toddler to put on his shoes, you are negotiating every day. For decades, most people believed that the goal was to split the pie fairly enough that each side felt they'd won. Yet in a world where vast amounts of information are at your fingertips, Inventive Negotiation gets you more than a pie . it helps you build a pie factory. 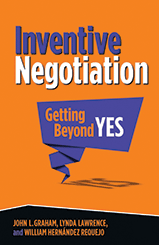 Drawing on three decades of research and practice in international negotiation and innovation, this book will teach you both the principles and the practical steps you'll need to get beyond yes and build productive relationships for the future. Using the latest findings in neuroscience, experimental economics, socio-linguistics, virtual teams research, and network analysis, plus real-world examples from Apple, Disney, Pixar, Amazon, IDEO, Boeing, Mitsubishi, Ford, Toyota, Boeing, GM, GE, PG&E, Philips, and even the Marine Corps, the authors show you a whole new way to think about the process. Along the way, you'll hear the first-person stories of people who have bribed their way into a Bolivian prison, talked gang members out of killing each other, and resolved the decades-long conflict in Northern Ireland. You'll learn how to get what you want from the phone company or a grumpy neighbor or a Columbian outlaw. There are lessons from experts in clowning and hostage negotiation. Plus vital insights into diverse teams and the nuances of dealing with people from other countries and cultures. The authors offer the latest ideas about human exchange, and about how to conduct Inventive Negotiations in all aspects of life . personal, commercial, political, and global. Once you've learned the art and science of Inventive Negotiation, you'll never be satisfied with transactional or integrative bargaining again.